What queer person cannot relate to Naomi’s fate at one time or another? Feeling lonely, without family, without support and without a clear picture of the future – surely many of us remember a time like that. If we are lucky like Naomi, that reality changes. When she encourages her daughters-in-law to return to a more certain future with security and promise one daughter-in-law, Ruth, stays and pledges an oath of fidelity inextricably binding her life to Naomi’s forever, giving us one of the Torah’s most poignant examples of a family of choice. Her pledge is so complete that some people question if there was more than a mother-daughter bond, but rather that of a life partner. Indeed many people, lesbians and straight folk alike, use Ruth’s pledge as part of their life-long commitment to each other. The text does not answer what their relationship is, but the question itself is important and allows us to wonder. To me, the even more powerful message is that through this pledge, the future changes, a future that will eventually lead to the messianic age. This transformation is the most queer part of the text. It is this pledge of mutuality and shared destiny in the face of the unknown that enables what is clearly a path of despair and hopelessness to be transformed so powerfully that it produces the seed of the messianic line. Through a series of events, some even say through God’s hand, Ruth meets Boaz, a kinsman of Naomi. He admires her dedication to Naomi and offers them support and comfort. Eventually, Boaz decides to join their family of choice from which an offspring emerges beginning the Davidic messianic line. Here we see that God can be powerfully known and experienced through a relationship. If that is not a revelation as profound as Torah, I do not know what is. It is often through selfless giving that God is known as powerfully as if the earth was shaking and thundering. Even more revealing for queer folks is that this relationship occurred in the margins. The central elements of this story take place in Moab, a questionable place at the time, and in the fields – a place of danger and transition. The central players are likewise marginal: widows, older people and strangers. And yet, here in the margins, godliness manifests. Ruth is a testament to everyone that God’s presence resides in those places society shuns or pities. Why is love always seen by our corrupted society as sexual. Love is Love and committment to another – whether a friend, parent, mentor does not have to involve sexuality. 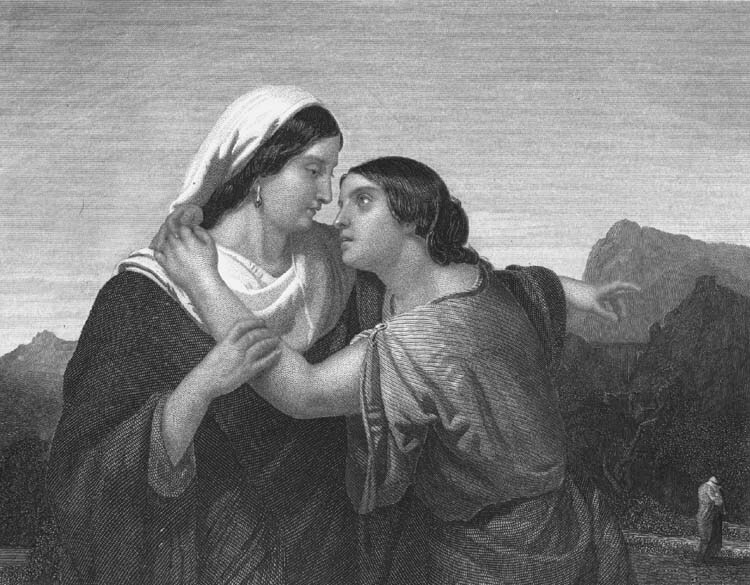 I find the aspersions cast upon Ruth and Naomi as a blight on their memory and disrespectful. I believe that purity and Love (that everyone says they want but are truly afraid of) and virtue and Holiness are so feared by those fallen that they need to cover it over to protect themselves from seeing it. Sad..as it clouds over the very clarity and love that is sought.